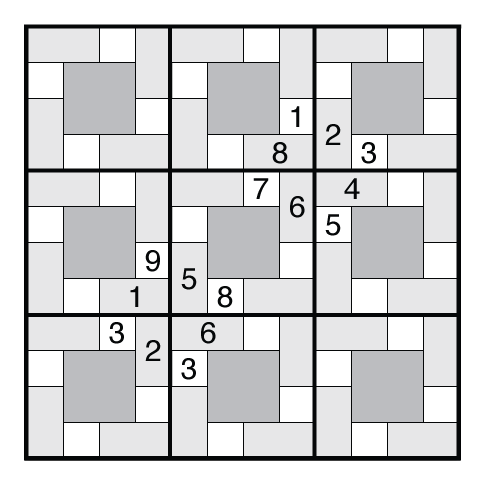 Author/Opus: This is the 215th puzzle from Thomas Snyder, aka Dr. Sudoku. Rules: Standard Tile Sudoku rules. 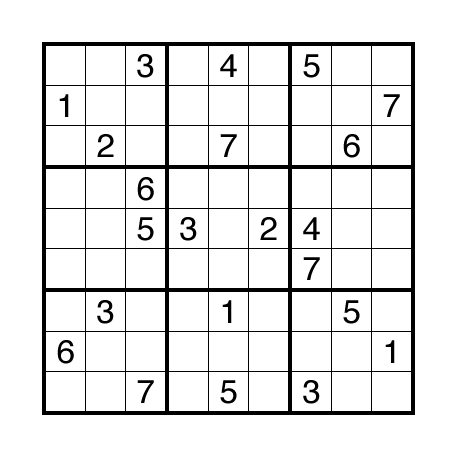 Note: Follow this link for other Tile Sudoku. Two more from the US Sudoku Qualifying Test in May. 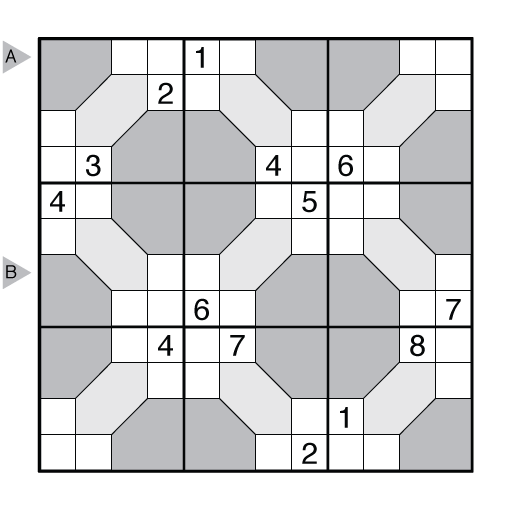 The first, a Tile Sudoku, is a pattern I’ve used before but not in my recent GMPuzzles series of Tile Sudoku. 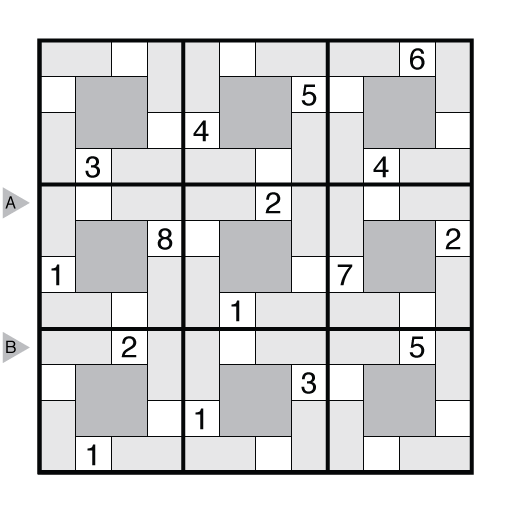 Like almost every single one of these Tile Sudoku, there are “meta-constraints” forced by the geometry change that make the solve easier. First, all the 2×2 squares form a 1-9 set, which is not that hard to prove. But did you notice that each 1×3 rectangle made out of a 1×2 + 1×1 cell is part of a triplet of such rectangles that will contain the digits XY, YZ, and ZX? Because each of these 12 groups of linked 1×3 rectangles need at least one given placed into them, this 16 given puzzle is pretty close to minimal for the geometry. 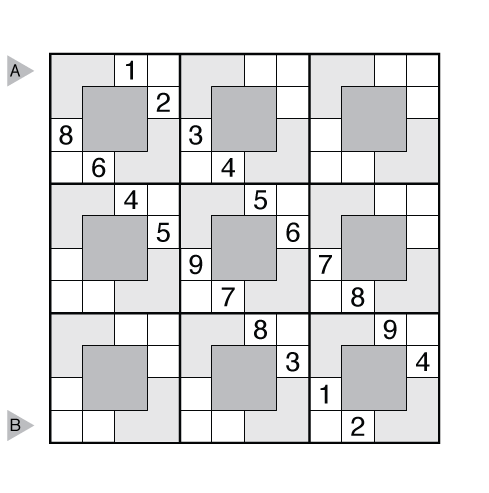 This puzzle’s goal was to have a clean 1-8 clock in one of the two symmetric groups, and then a choice of the remaining digits to leave a non-trivial solve even if solvers know about some of the hidden groups. The second puzzle – Dynasty Sudoku – was a newer style for me. It’s an idea I’ve had in the back of my head to use a lot in a kind of follow-up to Mutant Sudoku. But I had not put it to paper before Adam R. Wood debuted it on the 2011 USPC. Of course his grid needed irregular regions and a 12×12 size to get a lot out of the dynasty rule. I challenged myself to make an interesting 9×9 puzzle with regular regions that still required several deductions based on not closing off the white spaces and I think I succeeded with this puzzle. Theme: Pattern in regions and digits. Answer String: For the USSQT, the answer strings were a set of rows/columns encountered late in the puzzle. For this week, you can just hit the solved button on an honor system if you think you’ve solved it. 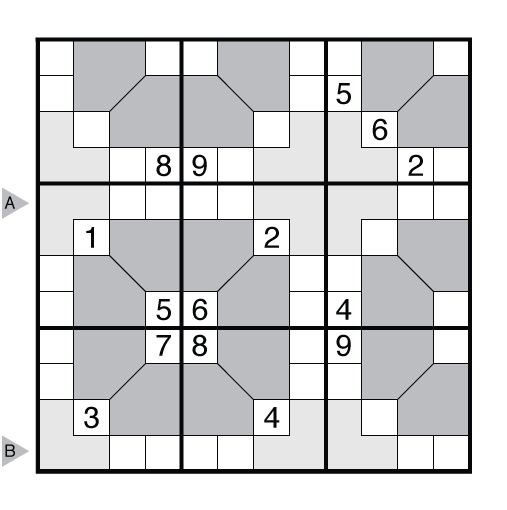 Rules: Variation of Sudoku rules. Place the digits 1 through 7 and two black cells in each row, column, and 3×3 region. Additionally, the black cells do not touch each other on the edges, and the white cells must form a single connected region. Answer String: Enter the 5th row from left to right, followed by a comma, followed by the 12th row from left to right. Theme: Start Small – find your way to fill in those bigger squares. Answer String: Enter the 1st row from left to right, followed by a comma, followed by the 12th row from left to right.